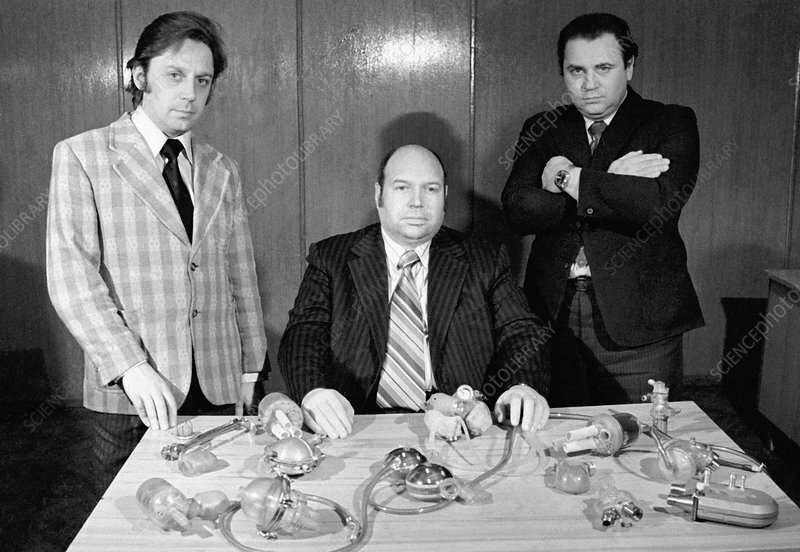 Artificial heart researchers, in Moscow, Russia, in 1976, with experimental models on the table in front of them. At centre is Soviet cardiac surgeon Valery Ivanovich Shumakov (1931-2008), present in his role as director of the Moscow Institute of Transplantology and Artificial Organs. Shumakov co-ordinated Soviet-American collaboration on artificial hearts for over 20 years, developing several types such as the one shown here. Either side of Shumakov are Soviet surgeons Oleg Yegorov (right) Georgy Itkin (left).